"ColoradoTown.com KEYWORD CrackerJack...The Rocky Mountain Storyteller"
You Won't Believe This Show...And That's The Truth! John Story Brooks is a renowned storyteller and western humorist. 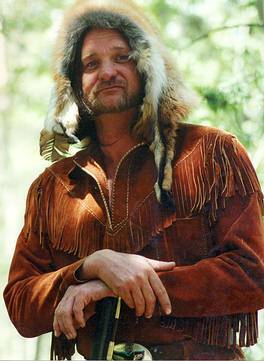 He has performed as CrackerJack "The Rocky Mountain Storyteller" in 5 National Parks and 15 State Parks Systems as well as many Guest Lodges, Dude Ranches and Campgrounds throughout the Western US. He is the producer of The Colorado Legends Show and publishes ColoradoTown.com and ColoradoEnews and ColoradoVisitorVideos. He is currently telling the stories of towns in Colorado with his ColoradoTown Stories on Video Series. John Story Brooks is pleased to announce the release of his newest DVD and CD. This one hour program Legends, Myths & Barefaced Lies is a collection of Mountain Man, Native American & Yellowstone Stories, Songs & Skits. "The staff for Larimer County Parks & Open Lands want to say, THANKS A MILLION!" Everybody who attends your shows says how much they enjoyed you. We are delighted to be working with you over the summer providing campfire storytelling presentations." "Thank you so much for coming to Steamboat Lake State Park to do your "Legends, Myths & Barefaced Lies" program. Everyone absolutly loved it! I think you could have told stories all night and everybody would have stayed. You attracted the largest crowd this summer for any program in the park. We hope you will come back next summer and many summers to come." "Your program for the visitors at Boyd Lake State Park was excellent and the visitors enjoyed it very much. Due to the success of the program we would love for you to return. Thanks again, it was a wonderful program." "Thankyou for comming out to Eldorado Canyon State Park. You drew one of the largest crowds we have had in a long time. I believe both children and adults had a great time and hope you will return to this park so that you can share more stories and songs with our visitors." "Thankyou CrackerJack for your performances at Golden Gate State Park. You truly add to the enjoyment of the camping experience. Your shows are always well received with much applause and a good deal of laughter. We are delighted to have you back time and time again." "Your presentation at the For Lupton Senior Luncheon was AWESOME! Your selection of stories, the humor you built in and the delivery of the stories was some of the BEST STORYTELLING I HAVE EVER SEEN. We would be honored and delighted to have you return in the future."